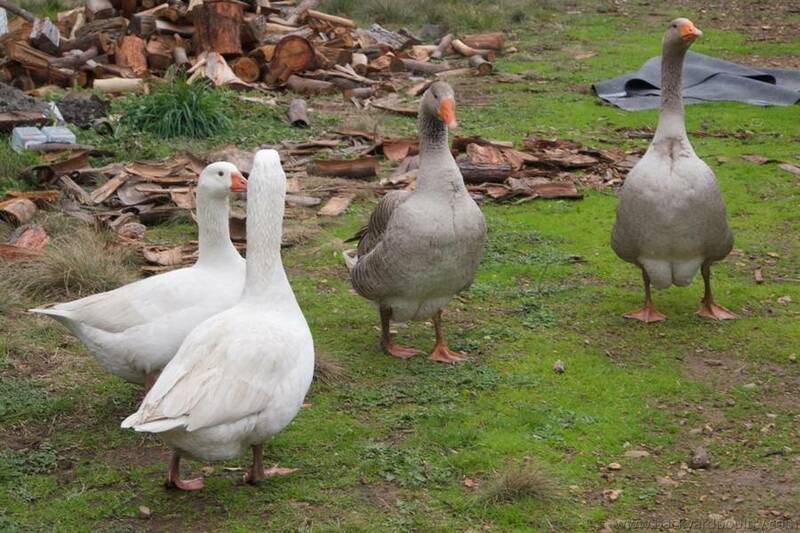 Backyard Poultry Forum • View topic - What sort of geese do I have? What sort of geese do I have? Post subject: What sort of geese do I have? More to the point, what gender? There are three batches here. The one with the white face is absolutely a female, came here about 8 months ago as an unneeded 2 year old female. The three large greys came as goslings, unsexed and unknown breed. The two whites came as known boys about 6 weeks ago. Someone is laying an occasional egg at the moment. And when you tell me breed and gender, can you tell me the identifiers, please? Post subject: Re: What sort of geese do I have? I can't tell from the pictures. In the absence of vent sexing you can look at behaviour. They tend to hang in pairs, the female in the pair tends to look a bit dumpier. The male kind of holds his head higher and hiss more. Also, the way colour genetics works, white birds are much more likely to be male. Yes you can get white females but random white birds are generally male. Generally this lot hang out in a single mob. The two separate at top were, unusually, separated as they went for a little wander. I agree they kind of have the look of Pilgrims or Aussie Setters, so yes the greys might all be female but I'm no expert sorry. I understand that the genes that condition the autosexing in Pilgrims (males white, females grey) also give that splotchy white effect around the beak in the female. But I'm not certain if you can that in random crossbreed males too. Sorry I'm not much help, but I think there's a fair chance the greys are females if they have that splotchy white thing happening. No idea, but I love them. Only know the 'reliable generalisation' with Pilgrims that white is boy and brown is girl, usually/probably. May I ask here, rather than beginning another thread: do geese inter-breed? 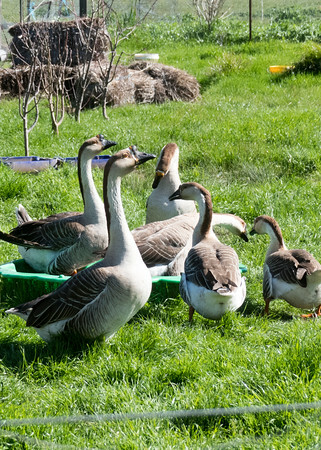 I have four male Chinese Geese and desperately need four at least females (before their commencing early springtime bickering ramps up to plain nasty). Can't afford the only female Chinese I can find not too far away. I can bring in some female Pilgrims, not that they are a 'cheaper' breed, just been offered some that don't entail a full day go to collect. Is cross-breeding geese usual or a really bad idea? I see a lot of cross-bred ducks around, but not sure with geese. Yes geese will interbreed. My Chinese Gander needed wife in a hurry after he lost the previous 'love of his life'. He now has white cross breed lady and they are happily bonded. I haven't set any of their eggs because I don't want more geese (and not crossbreeds). He has also taken on 2 large white ducks and protects them from the 2 mussie drakes. All 4, 2 geese and 2 wanna be geese, spend their days in their own 'clump'. Yes that was the unspoken bit of my question. (It's a bit like the Araucana 'thing' isn't it). Might hope they don't do one another a violence, be sensible and wait until I can find some Chinese females closer: or if I get really desperate buy some eggs to incubate as a longer-term plan. Well now, here's a thing. One of the whites appears to be female. Either that, or one of them has decided it's an emu and makes nests and sits on the egg that another goose has laid. If so, then they might be a bonded pair, which could be an issue if they're brother/sister (I'm not exactly sure). The white-faced girl has gone broody and is sitting on two eggs - one of her own, and one ... someone else's? One of the plain grey geese is hovering around. Is that likely to be her bonded male, or a girl looking for a spot to lay her egg? Early eggs don't seem to be fertile - I haven't cracked a recent one yet to check. Do they have the bullseye like chook eggs do? I'm now going with a "knob on the beak" theory for determining gender. One of the whites seems to be a little bigger, and is developing a bump on the beak. Very, very minor difference - will take photos in a weeks' time and see whether it's obvious enough to use. One of the geese-sellers I rang the other day to try for some more females said their own experience with the Pilgrims is the opposite to common belief - in that their whites were female and mealy-brown-greys were male. 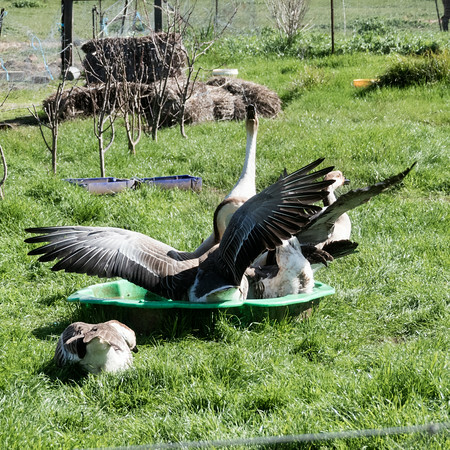 With brother-sister matings, seems everyone with a few geese does this, raise a clutch and find them difficult to separate so they are "just left to themselves". So buying eggs might mean a little more asking the question than just buying over the internet because they are closer by. I'm hoping there will be a breeder or two at the next couple of auctions - Kyneton and Bendigo - to learn more, maybe locate some female Chinese. Play pool looks small with so many big birds trying to get in,! Yes what news Infoaddict?? Did you have some females for eggs this spring or not so lucky? My update is pretty thin - one pair of White Chinese hatched one egg, the baby is only a few days old. Another white pair sitting on two eggs, and the Brown Chinese pair sitting on three eggs. 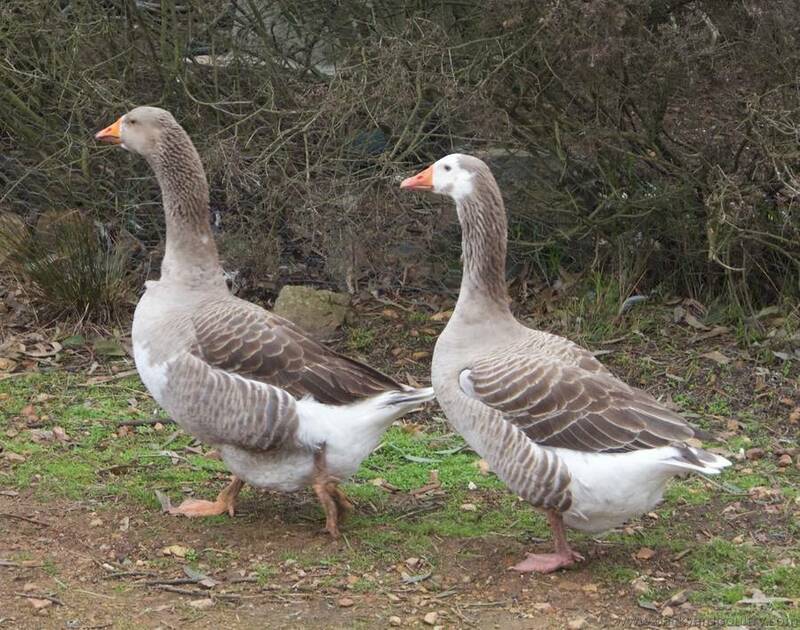 Also have a surplus Brown Chinese gander, and two white ganders from Crested Roman with maybe some Embden crossed into them, so nothing too special. I would still like three more females to suit those three: and two or three week-old goslings to give the singleton some company.